No Longer Empty’s 2013 NLE Curatorial Lab held a momentous contemporary art exhibition at 24 West 8th Street in Greenwich Village. Selected artists filled this formerly-vacant storefront with site-specific works that explored the street and neighborhood’s unique history of commerce and culture, and envisioned West 8th Street’s rebirth as a mixed-use destination corridor, engaging the community in critical dialogue around its future. The artists in Gathering Place responded to residents’ expressed desire for new spaces on West 8th Street and in the surrounding neighborhood that provides not only interesting dining and shopping experiences, but also communal and cultural experiences that call out to the area’s history. Artworks included installations in different media that resurrected specific aspects of the area’s past or even incorporated found materials from the neighborhood. Participatory art projects gathered visitors’ observations and opinions about this site and its ideal future development. Collected responses were shared through the exhibition’s run. Don’t throw those take-out coffee cups away—turn them into art! Cupcycling artist Gwyneth Leech will be on site to draw on cups with visitors of all ages, alongside her cup art installation. There will be empty cups for you to use, or bring your own! Children ages pre-K-10 can experience the wonder of books and the joy of reading. Spiller will introduce a selection of children’s books that relate to Greenwich Village, and a craft project with Village-specific coloring book pages and a competition to design your own! The Lomography studio on West 8th Street and NLE Lab curators will co-lead a scavenger hunt for all ages on and around 8th Street. Learn how to use Lomography’s unique film cameras to explore the neighborhood’s rich history of commerce and culture. 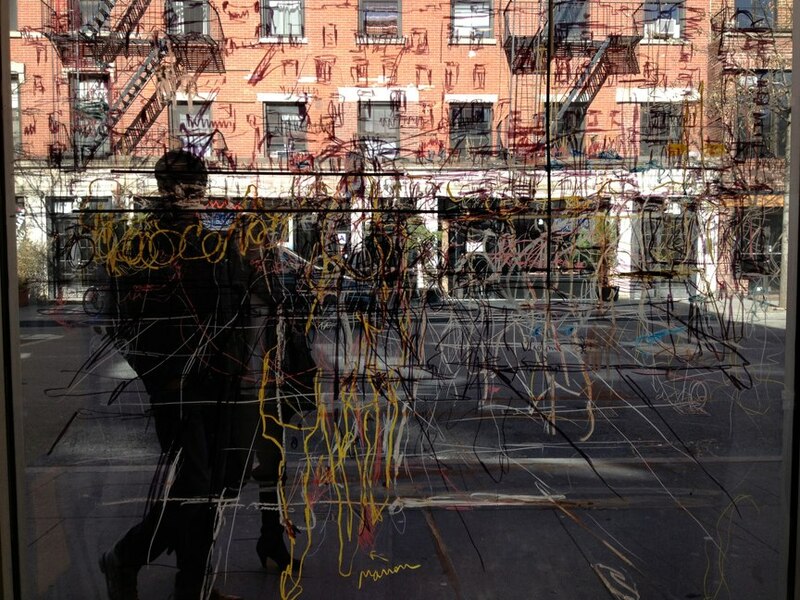 Katherine Gressel is a New York-based artist, curator, and writer focused on site-specific art. She received her BA in Art from Yale and MA in Arts Administration from Columbia University. She has worked as Project Director and Curator for the FIGMENT Sculpture Garden on Governors Island and her original annual exhibition series, Brooklyn Utopias, engaging local social and environmental issues. She currently serves as Programs Manager at Smack Mellon gallery. Jessica Wallen is a New York-based arts facilitator, curator, and writer. Before moving to the East Coast to study at New York University in 2010, she produced exhibitions in San Francisco and Berlin while devoting her time to advisory board duties for non-profit alternative art spaces. She currently works as a consultant for MTA Arts for Transit and Urban Design. Learn more about the NLE Curatorial Lab. This program was supported by the Lower Manhattan Cultural Council and is a collaboration with Buchbinder & Warren and Village Alliance.